All you need for this simple recipe is regular white elmers glue, shaving cream, water, contact lense solution and optional ingredients include color, scent, glitter or baby oil. First, put one cup of glue in a large bowl. Next, add half a cup of water and mix. This ingredient will make your slime super fluffy. You add about 4 cups of foamy shaving cream and mix all of the ingredients well. After this you can add scent or color. Then add a few squirts of contact lense solution. 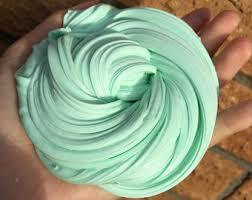 You can add as many squirts as you need for your slime to form. Once your slime doesn’t stick to the sides of your bowl you know it’s done. Now would be the time to add glitter or baby oil. Baby oil would make your slime less sticky. Now you can enjoy your fluffy slime.